Using your hands or a mixer, rub together the flour, sugar, salt, baking powder and butter until they form fine crumbs. Stir in the currants and the sultanas. Add the milk in 100ml intervals, stirring the mix until completely incorporated each time to form a pliable dough. Roll the dough out on a floured surface to approximately 7mm thick then cut the dough into scones using an apple corer. Place the scones on to a lined baking tray and cook them on the top shelf of the oven at 180C for approximately 10 minutes or until golden brown. In a mixer, whisk the egg whites on the highest speed until they are white and fluffy and form soft peaks (make sure your mixing bowl is very clean before you start). Whisk in the sugar at 100g intervals, ensuring that each batch of sugar has dissolved properly into the egg whites before adding more. Once all the sugar is incorporated, whisk the meringue until it is firm and forms stiff peaks. Spread the meringue out on to a lined baking tin and bake for at least three hours at 100C or until it is crisp and dry. Once cooked, allow to the meringue to cool then break it up and store it at room temperature. Hull the strawberries, dice the cucumber and pick the mint leaves from the stems. Place them all in a blender with the sugar and the lemon juice and blitz until smooth and the sugar has dissolved. 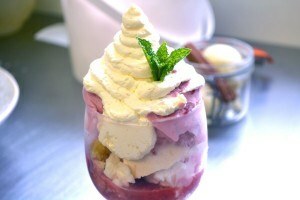 Using a half pint glass, place one scoop of strawberry ice cream at the bottom of the glass, followed by a scoop of clotted cream. Then place a small handful of crushed meringue on top along with two mini scones. Now pour over approximately three tablespoons of the Pimm’s crush coulis. Repeat until the glass is full then garnish with a mint leaf.